Hostgator has just announced the launch of its new Cloud Hosting product. With a faster, more scalable platform along with your data being replicated over 3 different devices for redundancy, is this the future of web hosting? Published: Jan 14, 2016. 11:17 +0100. 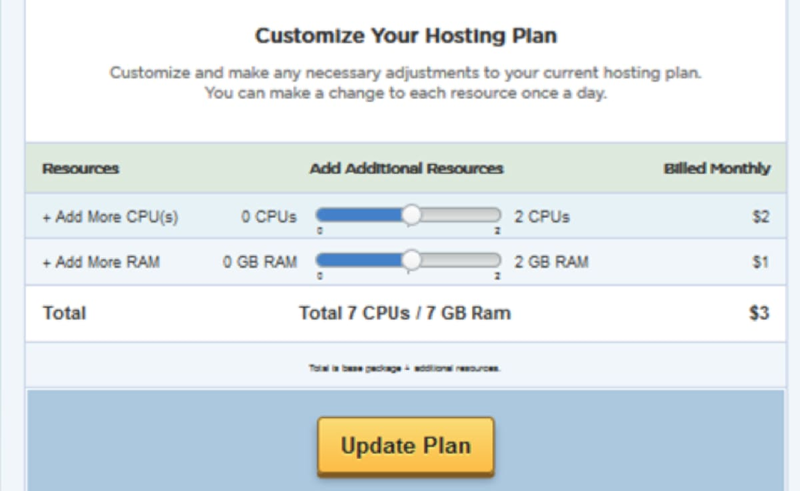 Hostgator is known for its “unlimited” hosting, and the new Cloud product builds on that concept. There are no limits on bandwidth, or disk usage, although you should check the terms and conditions to read through all the restrictions. As with most cloud products, you can scale RAM and CPU required with just a few clicks. This will enable you to plan for traffic spikes and general increases in traffic as your business grows. Hostgator market the product as “4x more scalable”, and we are not sure where they got this figure from. There are plenty of Cloud providers that scale easily, but with the pricing so low it is difficult to imagine they would be comparing themselves against this market. If the price of a server costs “X” amount, and to cover the costs of the server \ support you need “Y”, then it begs the question of how they make those low prices work. Scaling Resources at HostGator. © Screenshot. If the price of a server costs “X” amount, and to cover the costs of the server \ support you need “Y”, then it begs the question of how they make those low prices work. Of course, the parent company EIG owns their own data center, so their overheads may be significantly lower than their competitors, or they could just be reducing the number of support staff to manage it all. You can currently scale on demand by selecting up to 8 CPU cores, and 8GB RAM via the new Server Performance Dashboard. The Cloud-Sites hosting uses integrated Varnish caching. With Varnish only being supported on HTTP connections, you will see no performance benefit if you use HTTPS. That being said, depending on the configuration, the speeds should be very good with their Varnish caching. If you are looking for this kind of performance, including dynamic caching for both HTTP and HTTPS, then we highly recommend looking at SiteGround. With their new dashboard, you will get full access to all your websites traffic, and resource usage statistics so you can plan for the need to upgrade in plenty of time. Also, Hostgator provides a clear indication of your current CPU and RAM usage via a simple display. The information is real-time, allowing you to get clear information about your page download speed, server uptime, visitor information and resource utilization. Resource Management Statistics Source: Screenshot. This is the feature we are most excited about, and we want this to be the new “thing” for 2016. Automated data mirroring and failover are what many companies are having to do manually, and is quite often too complicated \ expensive for the average small business owner \ blogger to implement. Hostgator automatically copy replicate your files to 3 different servers. In the event one copy becomes unavailable, the automated failover functionality will switch to a different working copy. This ensures additional safety and redundancy for your data, and hopefully increased uptime. 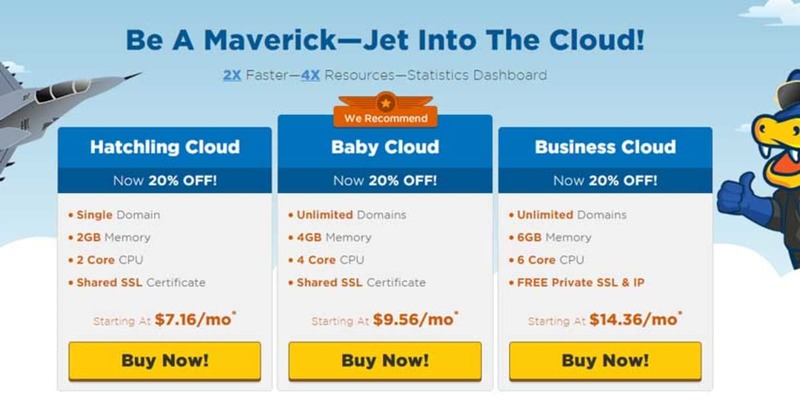 Hostgator advertises three different plans; Hatchling Cloud, Baby Cloud, and Business Cloud. Only the Business Cloud comes with a free private SSL and free IP, with the other plans only having access to a shared SSL Certificate. As we discussed earlier, you can fully customize these plans by adding more CPU or more RAM after you purchase, so if you want a plan with 2GB memory and 4 CPU cores, just buy the Hatchling Cloud and upgrade it once it is set up. Cloud cPanel Web Hosting HostGator. © Screenshot. On paper, the changes sound great, and something that was launched at their sister brand Bluehost some time ago. In fact, we would go further and say that this is exactly the kind of web hosting product people want. Many people (like us) are already configuring their own backup server and using failover DNS (Sururi \ DNSmadeeasy) to switch automatically in the event of failure. We have spoken to many hosting providers about this, and it is clear many people now look to purchase two hosting accounts in different locations just for this purpose. We just worry about whether the expertise and support behind the scenes are really there. Our last visit to Hostgator late last year revealed support wait times in the region of 1-2 weeks, whereas you would hope for 1-2 hours from any decent web hosting provider. Also, the parent company was responsible for the Arvixe debacle, as well as significant downtime over the Christmas period at A Small Orange (see recent user reviews for that period). So yes, we are excited about the features on offer here, just not so excited about the company who launched them. That being said, the support issues could be one of the main reasons for the redundant Cloud infrastructure. If one version of the website fails, a second copy automatically takes over. This has the effect of reducing support requests, which in the long run, may turn Hostgator’s fortunes around.